a series thinking about the patterning on the Emperors’ cloak, from my Aztec research (see 17-Nov-2014). That’s the subject of this post. This was spurred on by an article I’ve only recently found, A New Look at Tie-Dye and the Dot-in-a-Square Motif in the Prehispanic Southwest (an aside: one of the advantages of blogging – in my stats I followed a link from a referrer, which was a page of citations of one of my previous sources, and included a link to this new source). Could I get the appearance of a dot in a square? 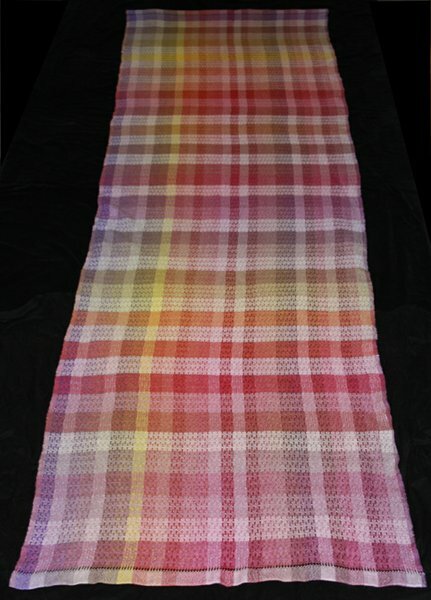 I chose a white voile cotton as my base – it had produced the brightest, clearest colour and patterning in the comparison done the first dye day. On the left are a tied and a clamped sample. 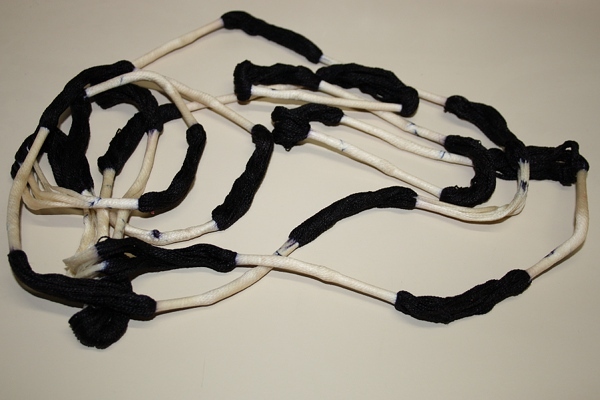 The tying was done with teflon tape – I didn’t want any additional patterning from thread or cord. The first idea was white squares in an offset placement, each with an internal dot of blue. I ironed folds in the fabric to help align my ties. It didn’t go so well. Placement is off and there is huge variation in shapes and sizes of “white squares”. 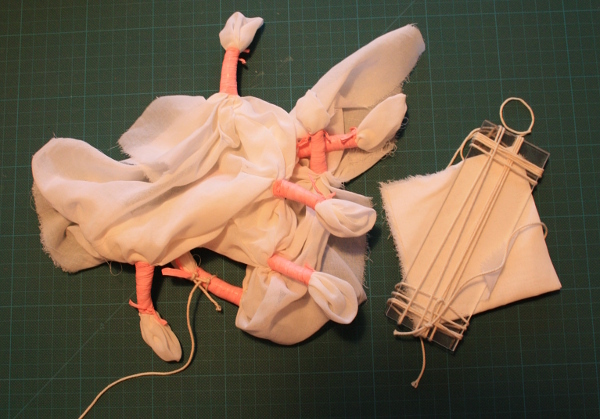 The second piece was accordion folded in one direction then the other, then two rectangles of perspex were tied around – being careful not to distort the fabric or introduce any extra patterning from the thread. I wasn’t clear about the pattern I expected, but this fits the “dot in a square” brief quite well. While this is a good, strong and clear pattern I really wanted a border of blue around the white squares, and to have the squares aligned with the grain of the fabric instead of on the bias. The scale is also rather larger than I was looking for. On the left is the next set of prepared fabrics. The sample in the centre is the critical one. This time the accordion pleats were folded on the bias, to align the pattern with the grain of the fabric. The package is held in two places, which I planned thought would produce the desired blue border. Instead of the 5 cm wide perspex, the resists are now paddlepop sticks. I am absurdly smug about the result. The sticks were wide enough to be effective (I hadn’t been sure), all my other adjustments worked as I hoped. 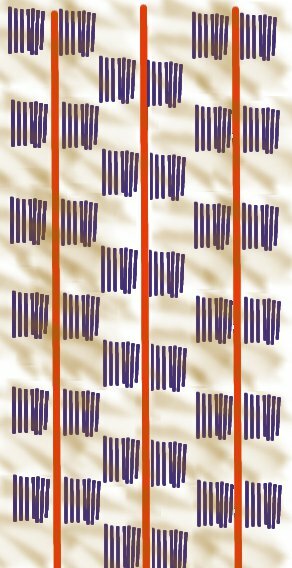 There’s a lot of extra layers of patterning, on the bias where the fabric was folded, plus a faint grid in blue – presumably from the bowing of the thin wooden sticks in between the two end ties. The white squares are about 8 cm across, compared to 19 cm on the first attempt. By this time a plan was forming for a garment – although not a cloak. The other two fabric pieces shown prepared above gave the results shown below. 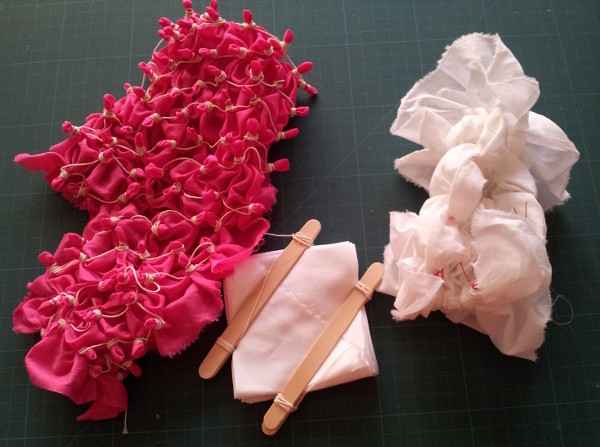 The tied pink fabric gives me a small stock of fabric pieces with that colour, and patterning at a smaller scale. It’s interesting to see the different effect on each side. The white stitching was seen on a linen sample earlier (2-Jan-2015). 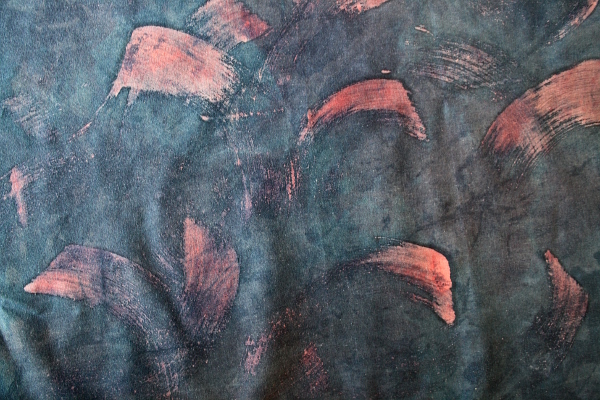 My final pair of fabrics is shown above, with a few process shots and the result. Pink and white fabrics accordion pleated, then wrapped around a pole, tied and scrunched arashi-style. I’m now playing with everything, looking at how they sit together. More later as the project progresses. 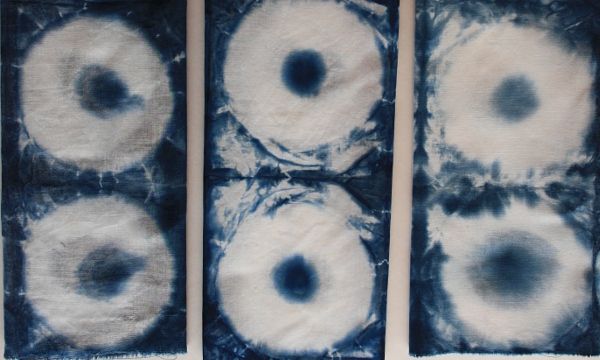 Earlier this week fellow OCA student Claire and I spent a day dyeing with indigo. 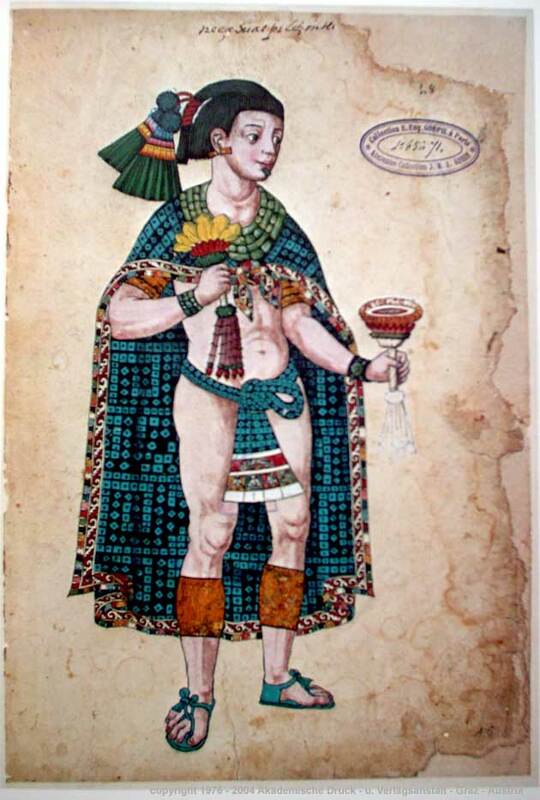 The idea came up when I was researching Aztec culture and design for the Cultural Fusions project. That project is on ice while I transfer courses in OCA, but we weren’t going to cancel the indigo (nor the cochineal – coming soon). I’ll add a link to Claire’s post about the day when it’s up. Claire’s post is here. 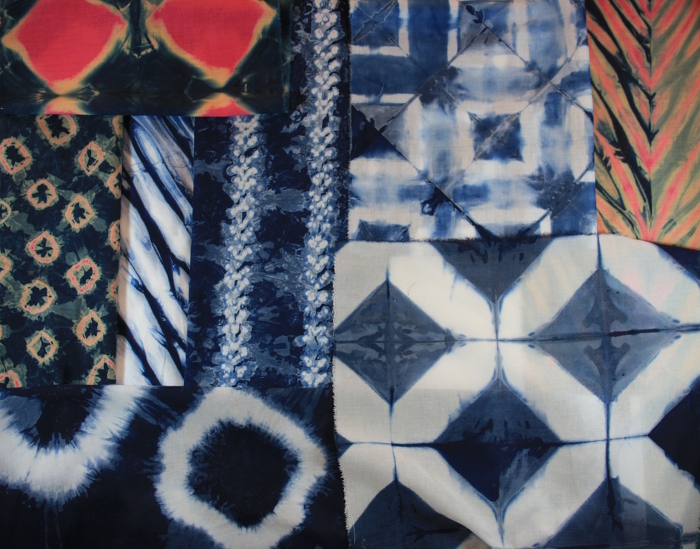 Both of us have done a little dyeing with indigo before, but always with a vat prepared for a group – never by us. 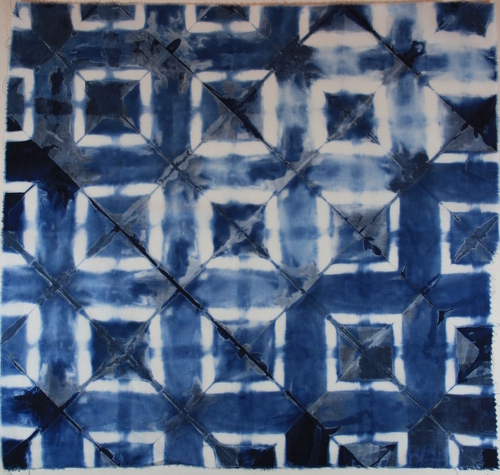 We used synthetic indigo from Batik Oetoro, weighed, measured, mixed, and waited an hour. We were so excited by our first sight of the result – photo to the left. A thin film of dark purple-blue on the top, and underneath a beautiful yellow-green. This is Claire, gently stirring. Oxygen is the enemy in an indigo vat. 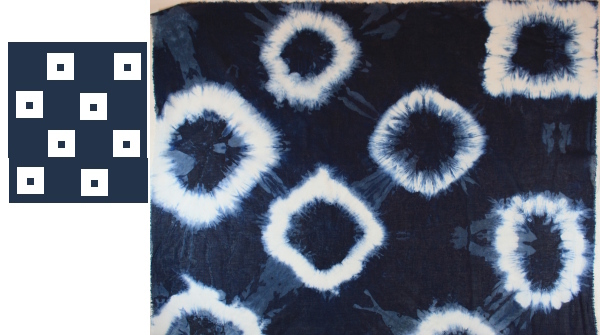 The indigo will react to it, turn blue … and not be available to dye your goods. Lower damp fabric gently into the vat, leave for a time, lift it out (trying not to drip into the vat – that would introduce oxygen). The fabric comes out yellow green, then before your eyes the indigo blue develops. Very satisfying. Both of us came prepared with experiments. There are some basics with indigo – the vat must be alkaline, the indigo must be reduced (oxygen removed) – but every resource I checked seemed to have its own “magic” process. How long should the fabric stay in the vat? Longer means deeper blue – but is that two lots of 15 minutes, or 1 dip of 5 minutes followed by repeated 1 minute dips (up to a dozen), or 20 minutes followed by 2 minutes followed by repeated 30 second dips? One source referenced a traditional Japanese process involving multiple dips over days, with rinsing and drying in between (more variables). I had a complex plan based on a total of 30 minutes in the vat. I would dip 6 swatches for 5 minutes. 5 would go back in for a second 5 minutes. 4 in for a 3rd dip etc. Secondary plans were also based on 30 minutes: a swatch would go in for the full 30. Another would have 2 dips of 15 minutes each. Et cetera. It didn’t happen. I did the first 5 minutes, then let the swatches oxidize while pottering around with other things. They looked a very dark blue, so we kept using 5 minutes as a standard. I rinsed and ironed dry a swatch and it looked a good, rich colour. I wish now I’d been more disciplined – with calmer eyes that blue isn’t quite so rich and deep. A second experiment was based on weights of fabrics. Three 40 cm squares of cotton were pleated and each was tied between a pair of DVDs acting as a resist (that is, reserving an area that won’t be dyed). 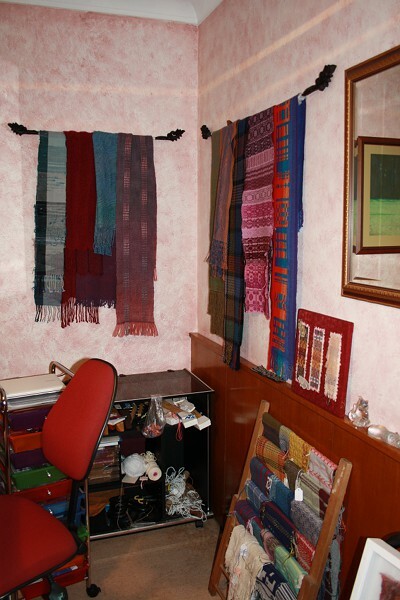 The cottons were a gauzy open weave, a voile, and a mid-weight cotton (left to right in the photo). All spent 5 minutes in the vat. The colour is richest and brightest on the voile. I speculate there is less material to hold the dye on the gauze, and not enough time for the dye to penetrate the thicker fabric. Claire brought along a cold wax (emulsified paraffin wax), also from Batik Oetoro, for us to try. I was very excited by the brushmarks I was able to make, and with the easy washout in warm soapy water. My choice of a pink fabric looks a little dull in the end result. 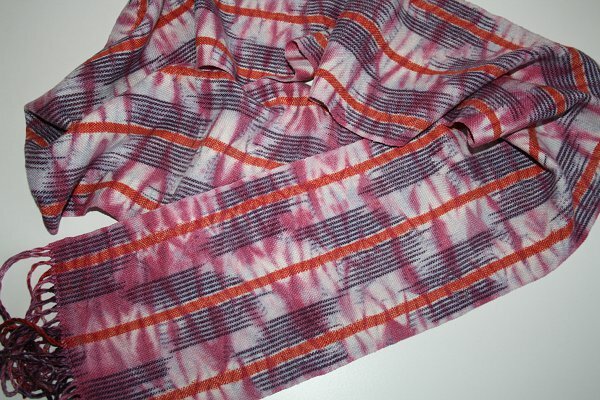 It was a mid-weight cotton I’d dyed some years ago, probably with drimarene K.
This shows a series of experiments with a pink voile (commercially dyed). 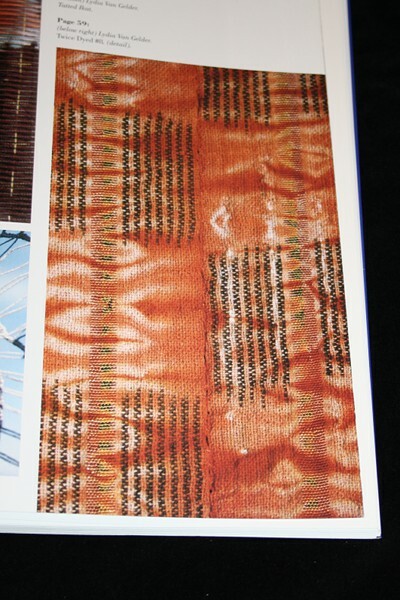 A swatch of the original fabric is top right. Below that is part of a 40 cm square that was pleated and tied between two squares of thick perspex. After 5 minutes in the vat this had rich blue where the dye wasn’t resisted and a halo of off-white around the protected pink. On the left are 6 swatches. Each had a simple knot tied in the middle to provide a resist. My plan was to dip them for increasing times. My original idea of 5 minutes, 10 minutes etc was reduced, based on the earlier sample. Unfortunately I chose 30 second increments – so the samples range from 30 seconds to 3 minute dips. There is more difference in real life – trying to sort them by eye I swapped a couple, but had the general sequence right. With the glories of hindsight I wish I’d used 1 minute increments. I tried the same process with a yellow, heavier cotton. The 5 minute resisted sample on the lower right almost has some blue. 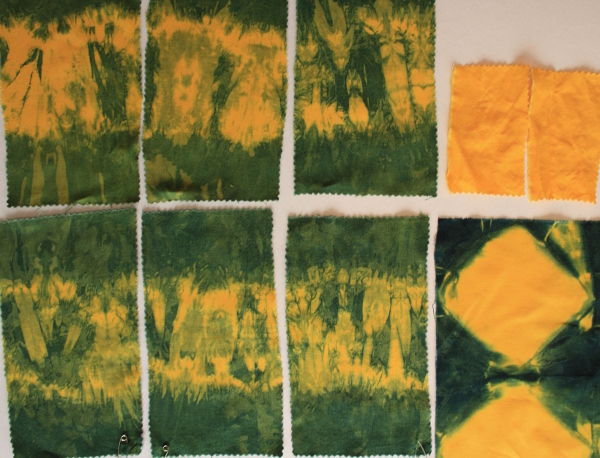 Most of the dyed area is a sequence of greens. Once again I was able to sort the 30 second increment dip swatches by eye, but the differences were tiny. A part of that was the unevenness caused by the knot and incidental folds of the fabric, but really it was that poor choice of timing. For this heavier fabric 2 minute increments would have been better. It’s interesting to see the pink and yellow resisted samples side by side. There is no sign of colour mixing on the pink sample. It is indigo blue where dyed, that halo of off-white, then clear pink. The yellow has no halo, then colour mixes to green. I believe the sodium hydrosulphite in the vat, used to reduce the indigo, is the cause. That chemical can also be used to discharge – that is, intentionally remove dye colours. 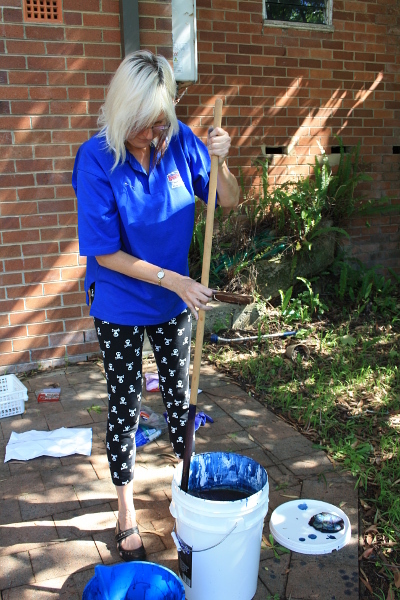 A discharge agent acts differently for different dye types, and even different colours within a dye type. I think the pink commercial dye was very susceptible to discharge by sodium hydrosulphite, so was completely removed where ever it was touched, even if there was insufficient indigo to leave colour. The yellow dye was much more resistant – so I got colour mixing and no discharge halo. My stamped linen sample was seen in an earlier post (2-Jan-2015). I had a couple of other fabric samples, nothing too exciting. Some white panne velvet ended up a very pale blue. I didn’t expect any colour at all, given it is 100% polyester. I suspect it is not at all wash-fast. My other main area of inquiry was paper, but I’m keeping that for another post. As the host of the dye day I still have the indigo vat and have been visiting it each day with experiments as part of my daily sketchbook. More on that in my next sketchbook roundup. 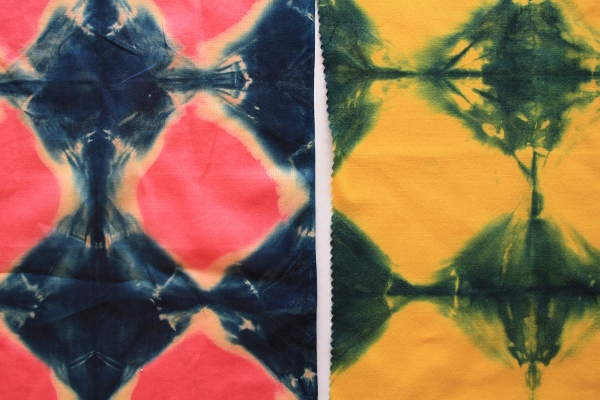 For my next ikat-ish experiment I want to reproduce? interpret? 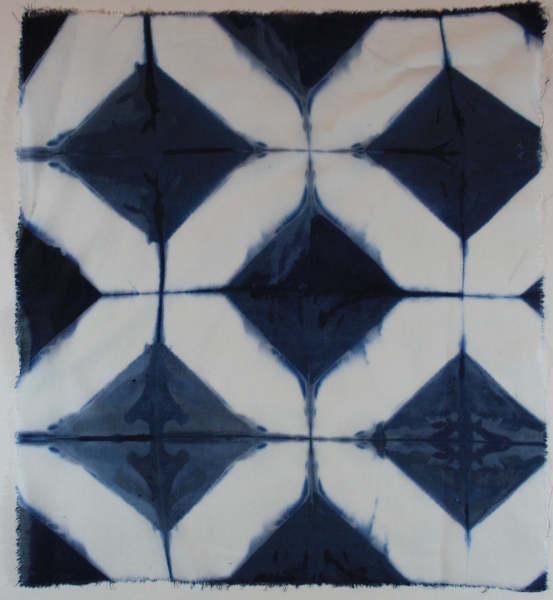 a piece in Lydia Van Gelder’s Ikat II. 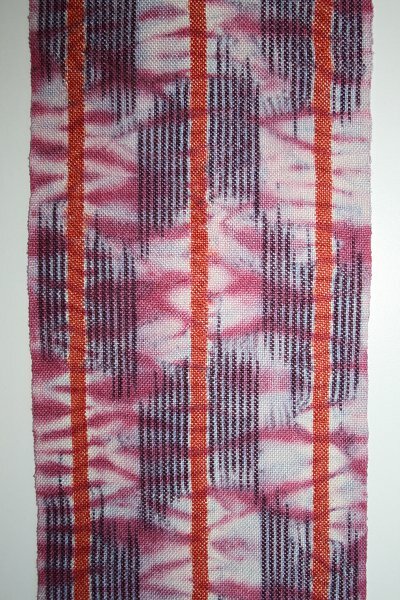 There are stripes of of warp dyed in long dashes (purple in the layout), stripes of solid orange and a simple woven shibori effect over. 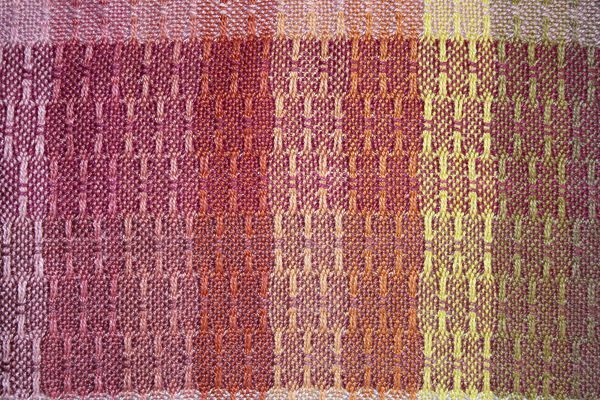 The idea is to custom dye the dashes, but in a skein of yarn from which I will wind the warp, so almost or fake ikat, not the real deal. This weekend was the dyeing. 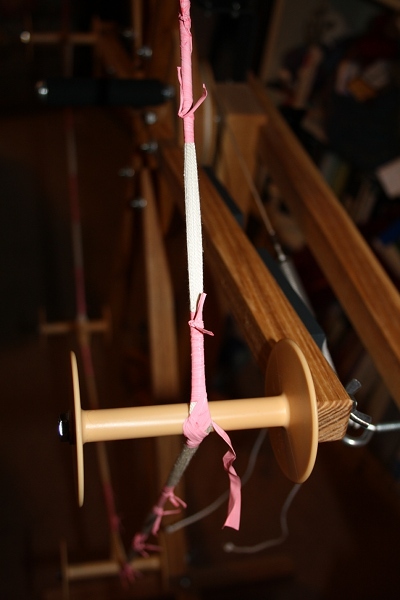 I used my warping wheel to create a big skein, then tried to mark out the dashes evenly. The best wrapping material I could come up with was plumbers’ teflon tape. There were 100 revolutions of 20/2 silk on the wheel, which compacted down pretty well. In the photo you can see there were a couple of tricky spots where I had to complete the wrapping after taking the silk off the wheel. Dyeing was my standard immersion in Lanaset dyes. I rinsed the result with the wraps still in place, then took them off for drying. 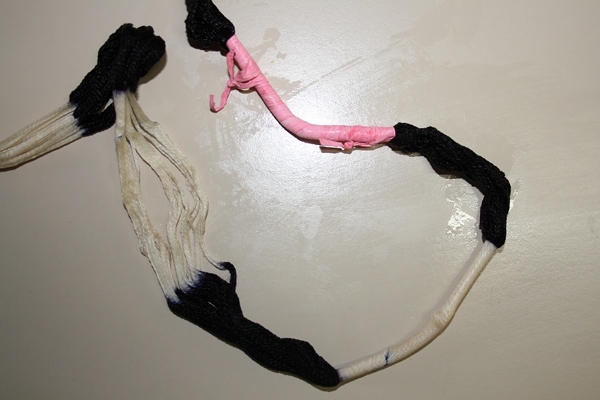 In the photo there is the pink teflon still in place, the next section with the wrapping off but the silk still compressed, and another section I have opened up a bit to look at the boundary of dyed and undyed areas. Generally it seems to have gone fairly well, although there is a consistent problem where I tied the starting end of the wrapping. On every section there is a spot where dye penetrated. Quite acceptable for a first attempt I feel, and I’m pretty confident I can fix it next time. Here is the unwrapped skein, still wet. The dyed parts are darker than I intended, though they will lighten a fair bit when dry. 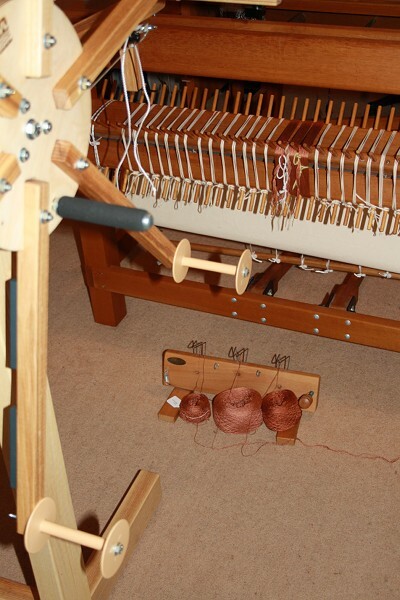 The next step will have to wait for next weekend – trying to wind and beam the warp with reasonable alignment. How did I mess up? Let me count the ways! 1: you didn’t see this last week. I miscalculated drying times in a humid Sydney and the planned warping time came and went with yarns still damp. 2. After all my warp calculations… I forgot about dyeing some weft!!! D’oh! 3. 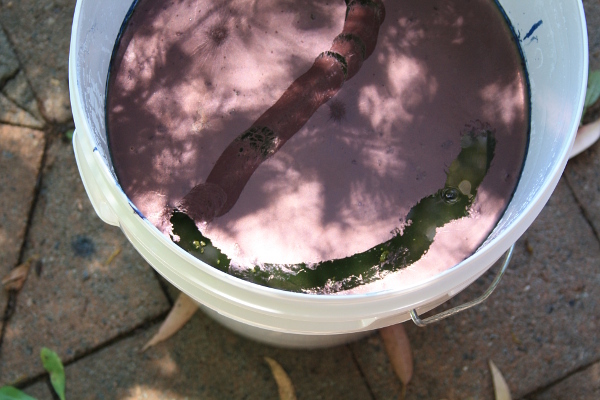 Dyeing yarns in the same pot doesn’t mean getting the same colour. 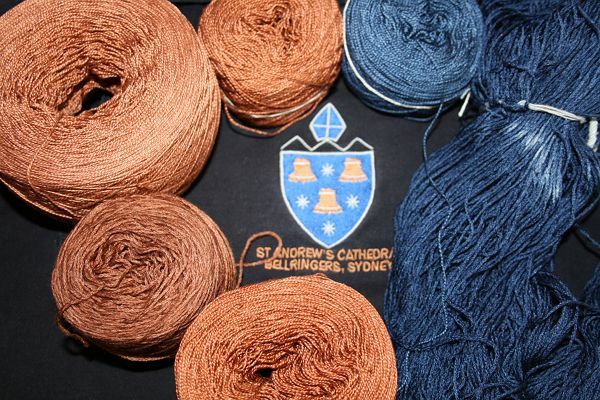 I chose colours from my dye marathon earlier in the summer – the brown and blue middle top. The base warp is the same 20/2 silk, the supplementary warp a 50/50 silk/merino mix. 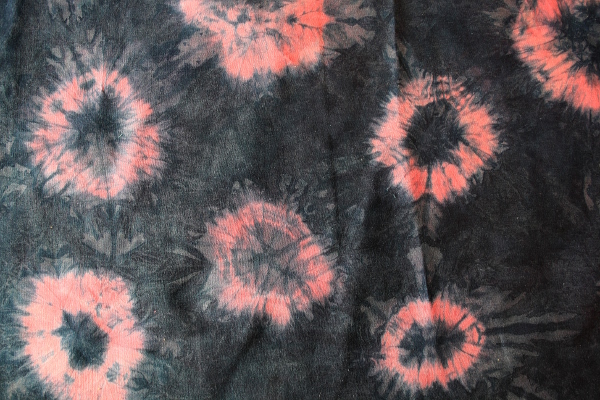 The browns I dyed together – the results are the next two cakes of yarn moving around the photo anti-clockwise. 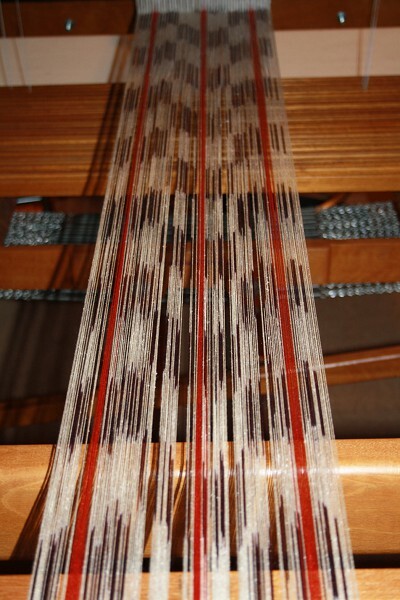 The silk/merino yarn gobbled up the dye, giving a darker brown and leaving the large amount of 20/2 silk pale. 4. 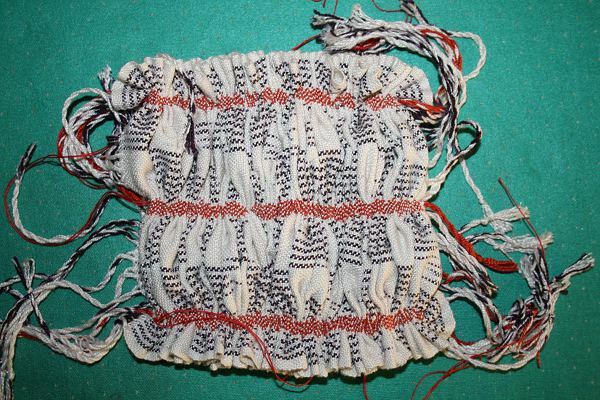 Finally I dyed some weft – the brown at the middle bottom. Actually this is OK. A different brown again, but in the ballpark. 5. The blue silk/merino at the right. I was using the whole hank and didn’t check the ties. Lesson learnt. a. I took the samples to weaving group on Monday night. Based on them I was planning to warp at 30 epi (15 each base and supplementary). Liz suggested the 40 epi sample was fine, or 36 epi could be even better. I only have a 10 dpi reed – to which the class pointed out both the possibility and a source for acquiring a 12 dpi. Since (fortunately!) warping had been delayed (see above) I can change plans and use the new reed which should arrive in a week or so. b. In the meantime other new weaving equipment arrived – an avl warping wheel. I took it for its first spin (ho ho) today and you can see the first few sections of 20/2 silk sitting smoothly on the sectional beam. Not everything has to be new. 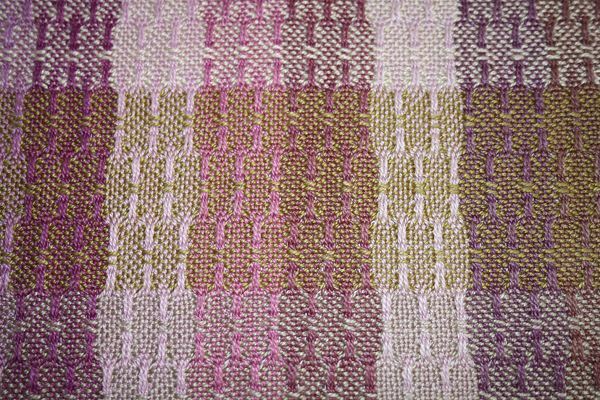 I decided to use all the browns in the warp and my lazy kate worked very nicely to keep things moving smoothly and separately. c. I still need to redye some blue silk/merino, but this gives the opportunity to go for a somewhat lighter depth of shade. Maybe it’s different fibres and sheen which is causing the darker shades. Current plan is to overdye the old blue with lots of black, which will surely come in handy one of these days. After all my trip-ups, not a bad outcome. A foolish but fortunate dyer. 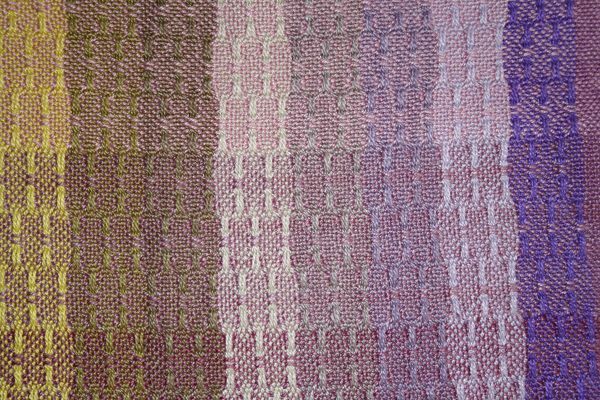 It’s done – 66 x 252 cm finished and hemmed (around 26 x 99 inches)! That’s one big piece of cloth to call a “shawl”, so it’s lucky I’m on the tall side. Seen flat it doesn’t work for me – it looks like a picnic table cloth!. 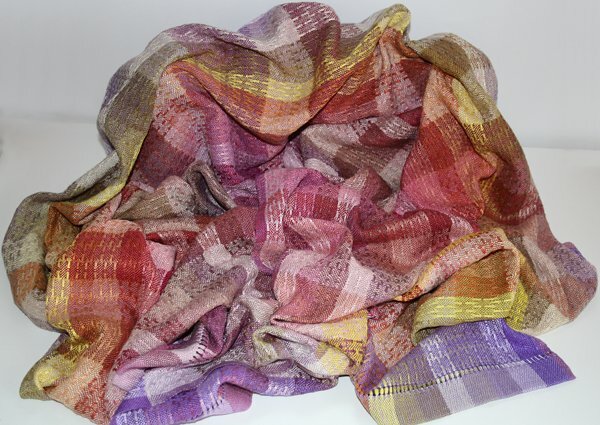 In a jumble or draped on a person it looks more interesting. That’s basically because I was focusing on its future use as a referencing and design tool, at the expense of the design of the particular piece itself. 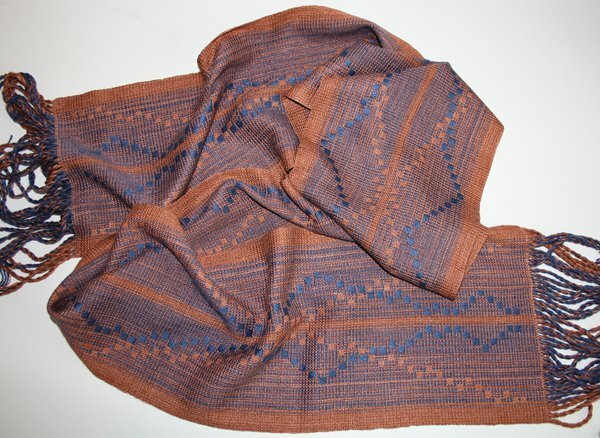 Of the 63 colours dyed, seen here, 62 are used in the shawl (oops!!). 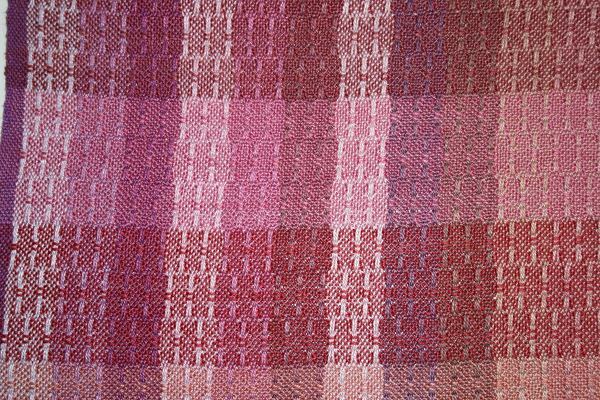 There are 30 warp colours and 45 weft colours, including 13 colours in both warp and weft. That’s 1,350 colour combinations (possibly 1,194 after subtracting the duplicates if I’ve got the sum right) from the original 3 dye colours used. At the detail level I find it fascinating. 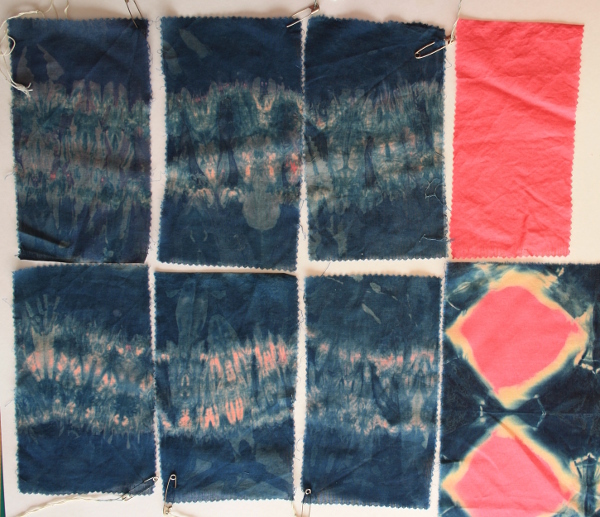 My original goal was to explore the different effects available by mixing colours in the dye versus optical colour mixing in the cloth. I think it’s going to take a long time to explore the answer(s), plus how far they can be generalised. For example, I find myself drawn to the chromatic neutrals (subdued almost greys, the result of including all 3 dye colours). 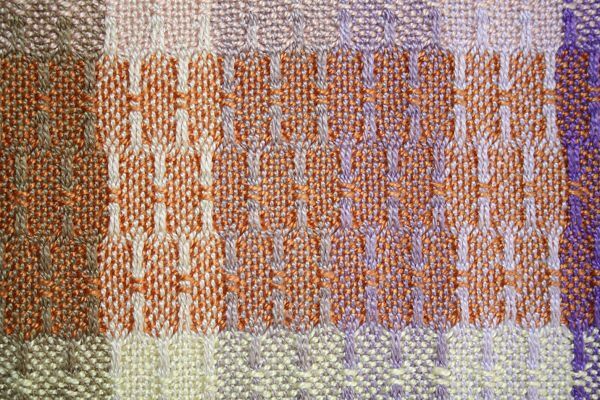 I think they are beautiful in themselves plus work very well as a unifying and enhancing element as weft across a wide range of warp colours – which could probably be predicted, given the shared dye colour “parentage”. I wonder how far I can take that with a different range of original dye colours. Some detail shots to finish. Regard the colour on your monitor as indicative only. I haven’t played with the colour in the software at all, but I’m seeing the photos on 2 screens at once (laptop plus a separate screen), and the colours displayed are quite different – rather a jarring effect.